At the time of our inception, in 1993, rural Haiti, and especially the Central Plateau, were known as « the outside country ». It had been so for centuries. With no reliable postal system, phone network, schools or real roads, the rural world was isolated from the urban realities and from the rest of the world. Implementing changes or improvements required our physical presence on the ground. Today, the use of cellular phones is widespread in rural areas. To take Haiti into the 21st century, internet connection and computer technology must be made available across socio-economic boundaries. 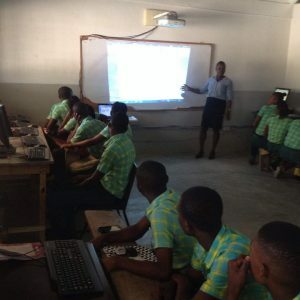 Please join us as we work to equip schools with internet connection and computer equipment.